The thing about records is they keep getting broken. Take, for example, the record for the most distant known galaxy. 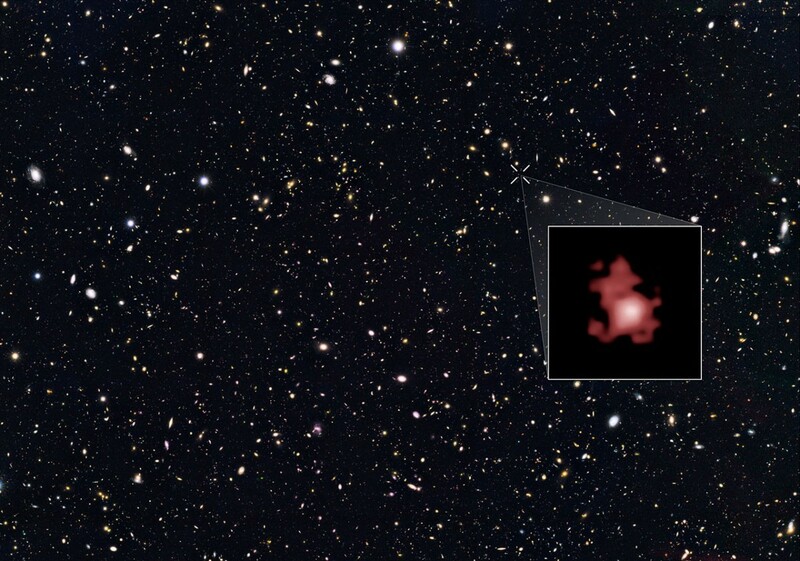 In October of 2013 the most distant galaxy had a redshift of z = 7.51. In February of 2015 we found one at z = 7.73, then one at z=8.86 in late 2015. Now there’s a new record at z=11.1. The distance of far galaxies is typically given by their redshift value z, where the greater the redshift the higher the number. Because of Hubble’s law describing the expansion of the universe, the greater a galaxy’s redshift the greater its distance. The reason we don’t simply give a distance is because the whole notion of “distance” in an expanding universe is a bit fuzzy. The light from this latest galaxy (known as GN-z11) traveled for 13.3 billion years to reach us. The galaxy was 2.6 billion light years away when the light began its journey, and the galaxy is “now” 32 billion light years away. The universe was only about 400 million years old when this galaxy was as we see it, which puts the galaxy close to the “dark ages” of the early universe. It is probably one of the early galaxies of the universe. GN-z11 is quite small, with only about 1% the mass of our own Milky Way, and only about 4% the size of our galaxy. Yet the small galaxy is producing stars at 25 times the rate of our current Milky Way. It’s that intense rate of star production that makes the galaxy bright enough for us to observe. This may be indication that the young galaxy is forming around a supermassive black hole, which would imply that black holes formed before galaxies. 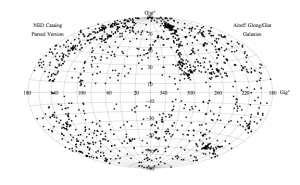 Here’s a post on the cosmic distance ladder.